“The Angry Eyebrows” is the initial program in Big Idea Productions’ new cartoon series LARRYBOY: THE CARTOON ADVENTURES. Good moral values are clearly woven into the entertaining story. Larryboy is an unlikely superhero in this series who works as a janitor at Bumblyburg’s Daily Bumble. When a crisis comes, he steps into the janitor’s closet and turns into a superhero. Larryboy even attends a superhero class. The instructor during his class session tells the unlikely group of superheroes that they should not let the sun set on their anger, which is, of course, a direct quote from the New Testament. Meanwhile, Awful Alvin, a crazed inventor, has developed a swarm of angry eyebrows, which attach themselves to people when they don’t let go of their anger. Larryboy has to use all of his wisdom to help overcome the angry eyebrows who are conquering Bumblyburg. Unlike VEGGIETALES, the LARRYBOY series do not use what’s called 3D animation. Instead, they are traditional cartoon animation. VEGGIETALES fans may at first be put off by the simplicity of the animation, but the story should quickly capture their attention. Larryboy is a likable if bumbling cucumber hero. Bob the Tomato makes a great editor in chief. Furthermore, the moral virtues are clearly woven into the story. The only slightly objectionable element is the use of a toilet plunger to help solve the plot problem. (BBB, M) Moral worldview which quotes Scripture; and, one minor scatological moment. 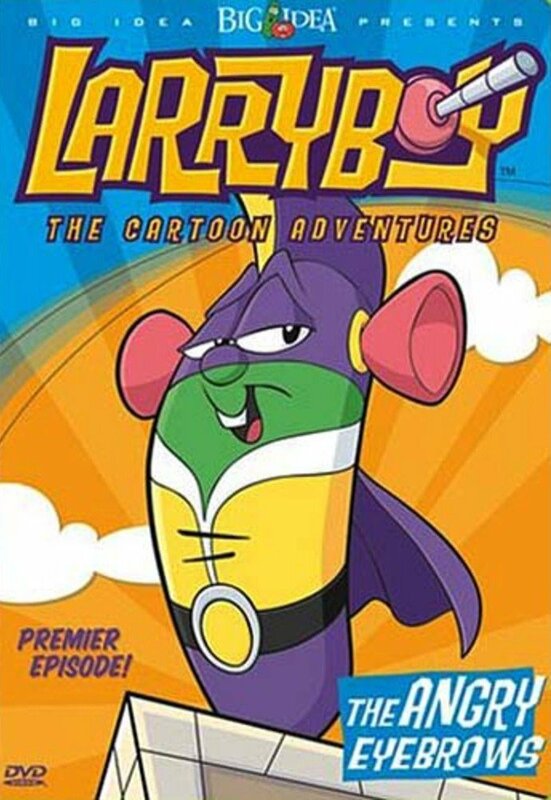 LARRYBOY: THE CARTOON ADVENTURES is the latest cartoon series from Big Idea Productions of VEGGIETALES fame. The initial program is called “The Angry Eyebrows.” Larryboy is an unlikely superhero who works as a janitor at the Daily Bumble. When a crisis comes, he steps into the janitor’s closet and turns into a superhero. He even attends a superhero class. The instructor during his class session tells the unlikely group of superheroes that they should not let the sun set on their anger, a direct quote from the Bible. Meanwhile, Awful Alvin, a crazed inventor, has developed a swarm of angry eyebrows, which attach themselves to people when they don’t let go of their anger. Larryboy has to use all of his wisdom to help overcome the angry eyebrows. VEGGIETALE fans may at first be put off by the simplicity of the animation, but the story should quickly capture their attention. Larryboy is a likable if bumbling cucumber hero. Bob the Tomato makes a great editor in chief. Furthermore, the moral virtues are clearly woven into the story. The only slightly objectionable element is the use of a toilet plunger to help solve the plot problem. Starring: Shari Belgeau, Marc Craue, Lee Marshall, Mike Nawrocki, Lisa Vischer, Paul Vischer, , Larry D. Whitaker, Jr.
Director: Larry D. Whitaker, Jr.